Quaint, old fashioned and lovely cottage, shaded by huge trees and cooled by off-shore breezes in historic Potts Point. Start the day with a cup of coffee while curled up on the glassed-in side porch with a book, end the day watching the sunset over the water from the front porch. Wander to the beach or buy lobsters straight off the boat at Erica's at the Dolphin Marina. Take in the lobster boat races after a short walk to Pott's Point. Enjoy farmers markets, restaurants and the Maine State Music Theater in Brunswick and then come home to the peace of Harpswell. Bathroom on first floor. New in 2016. Toilet, sink, shower. Please note that this cottage is on a well and we ask that you make efforts to conserve water by limiting showers & being mindful of toilet flushing. Room for 2 cars at parking area, one car near house. We have some beach towels but not enough for the whole house. Our family uses this cottage & there may be staples in the pantry that you can use. We provide 4 gallons of drinking water but you need to provide additional water for your stay. This cottage is on a well so we tell you to drink only bottled water & make efforts to conserve water by limiting showers & being mindful of toilet flushing. There is no dishwasher. Table has leaves and unfolds to seat 6-8. DIning room is not separate - it is open to the kitchen and living areas. No cable and no reception for TV channels. Some DVDs. Not a lot of kids DVDs. Picnic tables and chairs available. Firepit. Water is from a well - perfectly fine for washing and cooking but bottle water is recommended for drinking. We will provide 4 gallons of drinking water for you but you should provide the remainder for your stay. We ask that you make efforts to conserve water when washing, flushing and bathing. Ground floor has kitchen/dining and living area plus large glassed in porch with couches and chairs. No smoking indoors. Large outside yard - tables and chairs stored in shed for outside dining and seating. Not a late Fall/Winter rental - no central heat. The host was helpful and responsive. We enjoyed our stay at the cottage, but it did not live up to our expectations. First off, I do not think a full cleaning fee is justified when we had to make our own beds, strip them, wash all the dishes, and take out our own trash (which is normally the standard, but given that we left on Sunday and the dump is closed Sunday, we did not do this). The beds were old with holey sheets and stained bedspreads/pillows. The carpet is stained in several areas. It was not advertised that the water is not drinkable, and we were not provided water and had to buy/transport it ourselves. As I said, it is a lovely location and the house is a piece of history, but I would not pay for lack of amenities again. I found the VRBO description not comprehensive and somewhat misleading. Thank you for your helpful feedback. As I get ready for the next season of rentals, I wanted to let you know that I have updated the website description to include information about the fact that the house is on a well and that we do not recommend the water for drinking. Based on your review, we have inspected all sheets and removed the damaged ones from the house. Finally, we will add more photos so that renters can be better informed as to the rustic nature of the cottage. Thank you again. I LOVED this little cottage in so many ways. We are a family with 3 small kids (under aged 6) and just looking for a quiet retreat to have a simple, easy week, and we found it here. 1) The location was perfect for a quiet, relaxing vacation. Situated right near the water so we could sit on the front porch and watch the sun set with a glass of wine. Rocky beaches within walking distance- perfect for toddlers to walk and explore for sea glass and shells. For a bit more action, Brunswick is only 20-30 minutes a way with great restaurants. 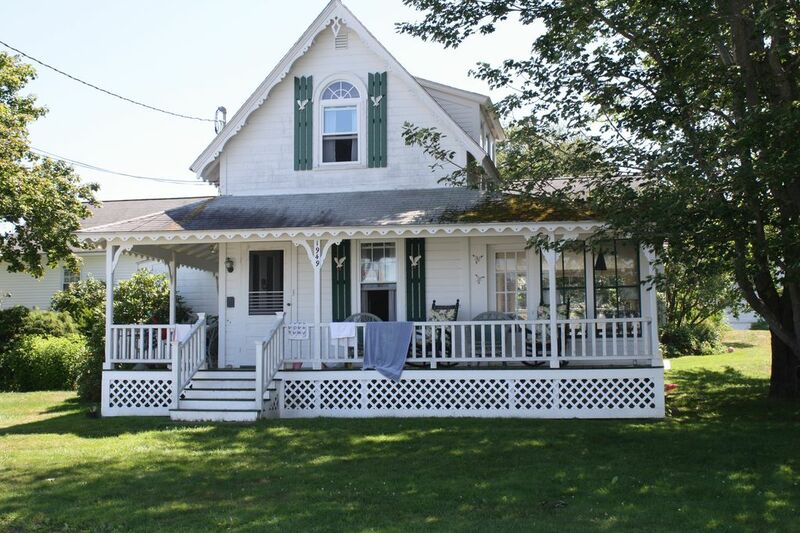 2) Cottage itself - this is an old gingerbread cottage filled with charm. The cottage is decorated like generations of families have been summering here - there was a closet under the stairs filled with old kids toys (toys I grew up with) and books for all ages on every shelf. It had a warm, cozy feel - I felt like I was borrowing a friend's summer house, versus a regular sterile rental. 3) Yard - We enjoyed the side yard making puzzles on the picnic table or playing ball under the shady old trees during the day and at night, enjoyed the fire pit or read in the glassed-in porch every night. It was nice to have a place the girls could go out and play. I walked away from vacation telling my husband that someday we need to buy a place like this just for our family. P.S. we had some questions pre- and post-booking and even post-stay and the host was incredibly responsive. cottage was very nice, good arrangements, nicely situated within walking distance of restaurant. No real beaches nearby, and road is kind of busy, but otherwise nice. My daughter and I stayed two nights in the middle of an intense college search weekend and we so enjoyed it! It was cozy enough to promote quality togetherness while also allowing us our own space. The best room in the house was the sun porch where we ate breakfast and spent time perusing the home's library. We thoroughly enjoyed exploring the two beaches and came home with some fabulous sea glass finds! The owners were very responsive to our questions/needs and did their best to ensure a hospitable stay. Loved our little cottage and the friendly neighborhood. Well equipped and comfortable. This fully-equipped Victorian cottage is delightful and fully captures the 19th century magic of Potts Point, in a well-maintained and updated fashion. Crossing over the stone causeway to the former island of Potts Point one encounters a charming small `traditional' seaside community with every amenity that families want for summer activities - swimming, boating/kayaking, ambling in tide pools, and the chance to enjoy lobster/seafood meals at the much-improved Estes Lobster House or a short drive to other good restaurants. We thoroughly enjoyed our two weeks in this cottage, in July 2017. "Week" defined as check in 3pm on Saturday and check out at 11am the following Saturday.